I guess your first experience (in your school life) of a music score of your band was look like this. The band score was (and still “is”) a very cool tool for us to learning for our favorite songs. 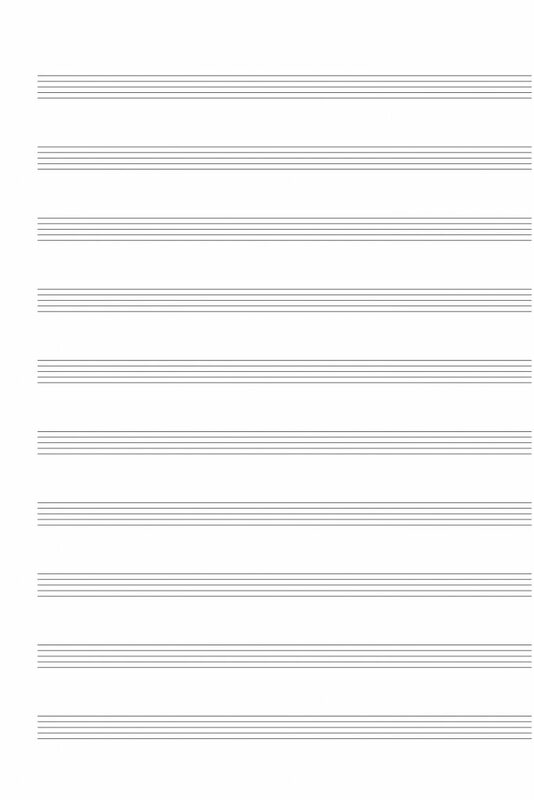 Even you have created your original songs with using the band score. “Intro, A, B, C, repeat, solo, and ending…”. It was very easy to create and share music among the band members. 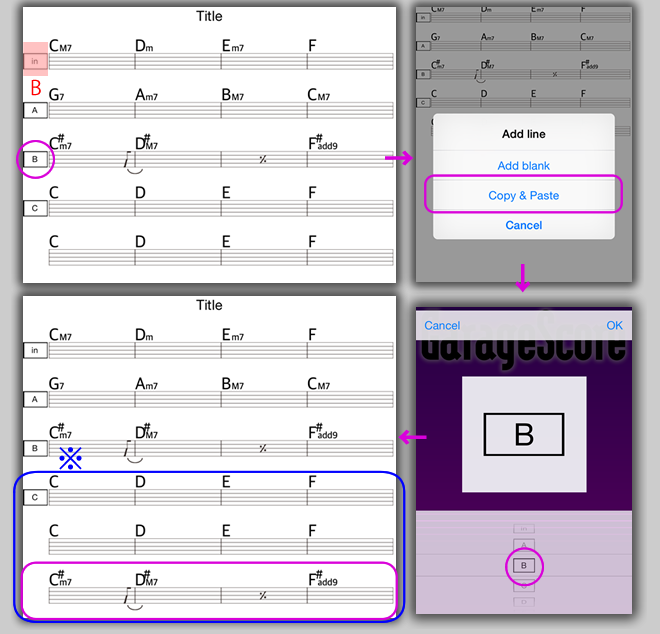 GarageScore show you not musical note but chord name on the notation window. GarageScore has two font sets. Draft for display and high-reso for print out. Let’s share your band score via iPad. 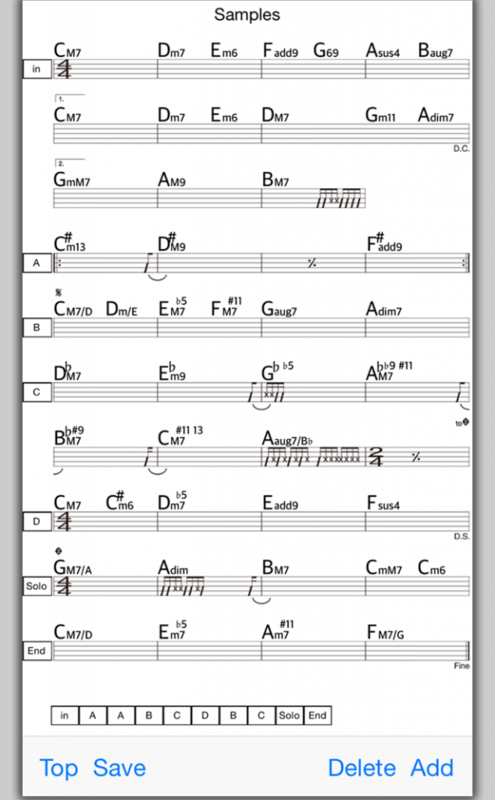 You can also print out the score and write down your ideal notes on that. 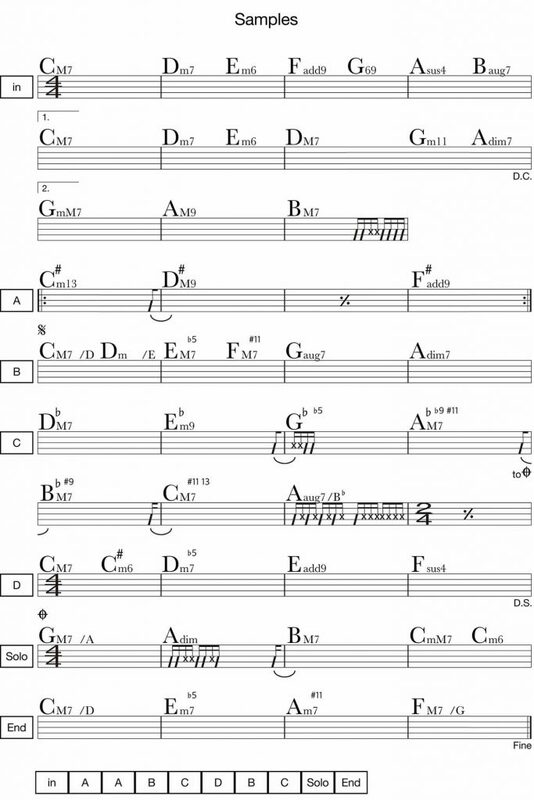 We make the notation score for your rhythm section and so on. Let’s try our free sample app and enhance your music life!!! Can creating almost chord name on a score with simple and useful interface (drumroll selector).. Including popular musical symbols (ex, da capo,coda,segno,tie,repeat). 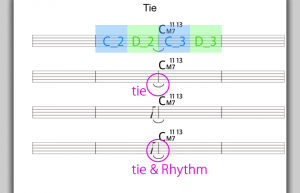 Can creating rhythm score and structure mark. Can copy each section displaying on the left window. Can edit section after paste. Can email and share your score with your GarageScore friends. Can export High quality JPEG score (for other OS or printing). Can print readable score with suitable font. Can taking your memo on the bottom of the main window. 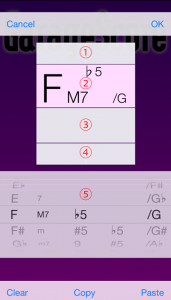 Creating multi page score (swipe available). After making a new score, input a song title. The title is used as a file name. Open saved score. Don’t forget to save before you edit your song. Email your score to other devices. Enjoy high quality JPEG score for printing! Email GarageScore file to other iOS devices. Your friends can edit your score with his/her GarageScore. Never forget to save when you open your friend’s GS score file. You can see PictA when you choose “New Score”. Tap C or D position, then Pict1 will be displayed. Starting with C or D, you can see the default position (Drumroll selector). If you need to select lines type or musical symbols, push “OK” on the right top of the screen. GarageScore have different types of selections The following is a list of selections. Select ③ on the main screen, then select “Notation“. 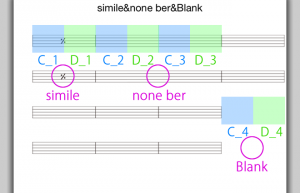 In the case of making “simile“, select “simile” between C_1 and D_1. In the case of making “none bar“, select “none bar” between D_2 and C_3. In the case of making “Blank“, select “Blank” between C_4 and D_4. Select ④ on the main screen. In the case of making “tie“, select ④ between D_2 and C_3, then select tie. 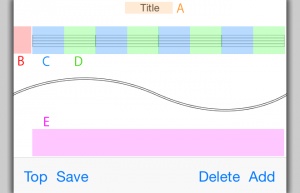 You can also use rhythm note when you intend to describe syncopation timing. *For example, select ③ at D_2, then select Rhythm and put Eighth note on. It will be appeared like Pict 4. When you push Add, Add line window will be appeared. If you want to reuse the pattern B, push Add, then select Copy & Paste. When you push OK, you can get all part of pattern B in your clipboard. This function is available in the Structure View mode. In the case of Pict 5, third line (4 bers) of the score will be copied. The pasted line has no structure mark. Please name it if you need. In Pict 5, pasted structure (the copy of pattern B) will be simply appended after pattern C.
You can write down your idea or memo about Structures into Position E.
GarageScore has 15 banks for Structures memo. Select only none bar when you make your new song (ex. emanon). When you finish to create 1 line none bars, named it (ex, Q), then Add line, Copy & Paste, 10 times paste the structure. After that, delete the structure named Q. Please delete the song name “emanon” and save file.The file name changed to “Date and Time” and disappear for printing JPEG file. This blank file is useful as template. GarageScore makes High-rezo JPEG data for clear output. 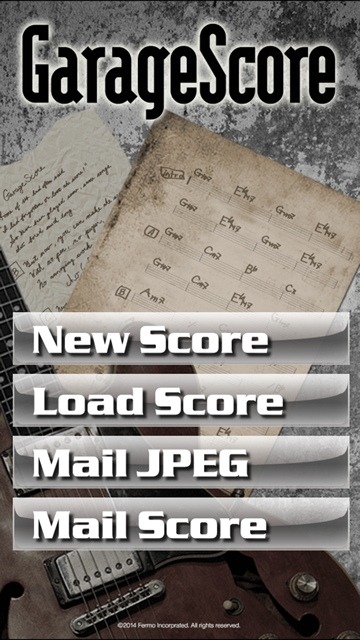 If you don’t need to print your score, please resize when you use “Mail JPEG” function. iPad Air 2, iPad Air, iPad mini 3, iPad mini 2　Retina display is recommended. iPhone 5s, iPhone 6, iPhone 6 Plus　※Scroll bar will be appeared when using iPhone 4s. Display four chord name in one bar. GarageScore has adjusted its font size for iPhone screen size. Our policy is that one score should be displayed one page. no scroll. Font size is the most sensitive issue for development. Some of rhythm note appare at a different position. Version up, bug report, or any other information will be published by our web site. GarageScore Free is also available for download. You can try to make your new score.